Compared to our previous motel, the motel we woke up in this morning was a paradise of luxury. Started this day with Subway for breakfast. Then we made our way to the north and I believe we crossed the Canadian border again. We even passed the smelliest motel again. Waited at a gas station a bit, drove to another gas station (the one with a tipi). Saw a lot of other stormchasers. We relocated to another spot somewhere in the middle of nowhere. This was a very popular location. I would say there were at least 20 to 30 cars and at least twice as many chasers. Here the real waiting game took place. The sun was really burning and there was a lot of moist in the air. But it was really fun to see so many gathering and watch them killing time. And then it started, radar images started to look better and better, cumulus clouds started to form, chasers were getting more and more exited. So we took off. Found a spot with a nice view of the first storm and waited for things to happen. We followed this storm for a few stops before it actually produced a tornado. And from here on it was really on! We lost count of how many we have seen in total, but each one had it’s own beaty. I saw small roped ones, bigger ones, real big ones. Some stayed in the air very long. 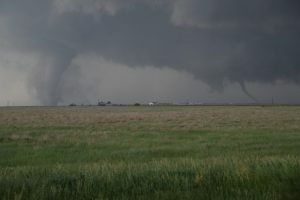 But on top of that, at one point we saw three tornado at the same time! Unfortunately not on camera. But I did got some pictures of two at once. 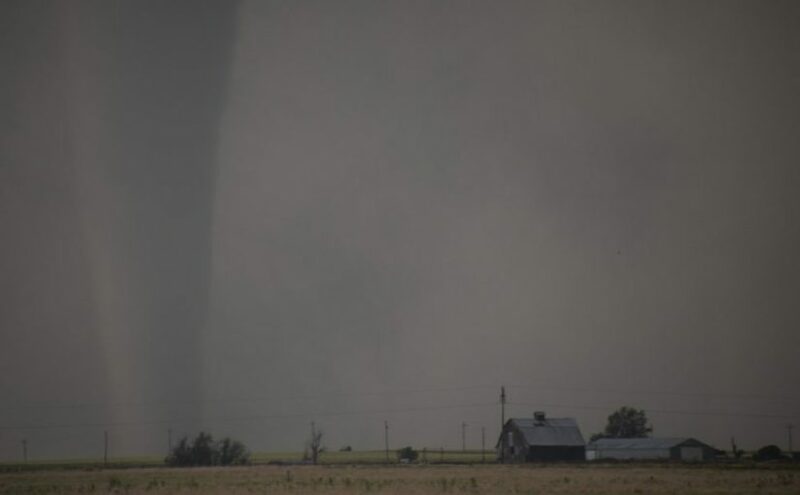 I hope everyone stayed safe, because things did not look good for the people in Dodge city (and maybe other places) at one point. After the chase we witnessed a beautiful sunset and a double rainbow. While driving to our motel in Hutchinson, the lightning activity was still insane. Also drove through a flooded street in the pouring rain. Late night and well deserved dinner and beers was at Applebee’s. A very short night sleep (after sorting all the photos and posting updates) is in Super 8, right next door to Applebee’s.